It seems a very long time ago that people out of work were exhorted by the then Employment Secretary Norman Tebbitt to “get on yer bike” and look for work. Some thirty years on it seems it’s the employed rather than the unemployed who are being urged to get on their bikes, as part of the Department of Transport’s multi-million pound cycling campaign aimed at tackling congestion and supporting economic growth. But by focusing on cycling as a transport-related initiative, is the Government missing a trick in its efforts to shift cycling up a gear both in the public’s consciousness and in the policy armoury? 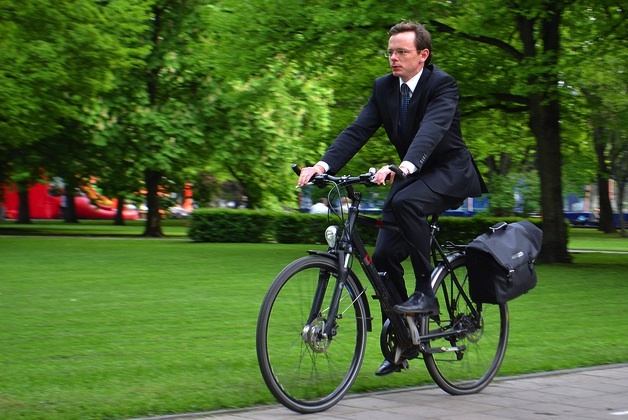 Society Central’s Christine Garrington examines the initiative in the light of robust new evidence on the health benefits of cycling to work. So in the rosy afterglow of the Olympics and the Tour de France, the Prime Minister wants to start “a cycling revolution”, to make it easier and safer for people who already cycle as well as encouraging far more people to take it up. Some say he has shown real leadership, while others say the Department of Transport’s recent £94m cash injection to promote cycling in cities and national parks across England won’t do anywhere near enough. The background statistics don’t make for encouraging reading that’s for sure. Currently, only 2% of trips in the UK are made by bike, compared with 14% in Germany and almost a third in the Netherlands. This is despite the fact that 43% of people own or have access to a bike in Britain and 38% of people could just as easily cycle for short trips than use a car. There are huge variations in levels of cycling across our towns and cities. 47% of adults in Cambridge cycle at least once a week, compared with fewer than 5% in other areas. There is some positive news, however. There was an increase in the second half of 2012 of people signing up to Cycle to Work schemes, a jump in sales for some bike retailers and greater levels of participation in local cycle rides and events. “British cycling is riding high – now we want to see cycling soar. Our athletes have shown they are among the best in the world and we want to build on that, taking our cycling success beyond the arena and onto the roads, starting a cycling revolution which will remove the barriers for a new generation of cyclists. In the same week as the announcement, researchers at Imperial College London and University College London published new findings showing that cycling, walking, and using public transport were all associated with lower risk of being overweight than driving or taking a taxi. People who walked to work were also 17% less likely than people who drove to have high blood pressure. Cyclists were around half as likely to have diabetes as drivers. The findings are published in the American Journal of Preventive Medicine. Nineteen per cent of working age adults who used private transport – such as cars, motorbikes or taxis – to get to work were obese, compared to 15 per cent of those who walked and 13 per cent of those who cycled to work. The study also found wide variations in the modes of transport used in different parts of the UK. Public transport was used most in London, at 52 per cent, compared with just five per cent in Northern Ireland. David Cameron’s initiative has certainly got its supporters. Malcolm Shepherd, chief executive of sustainable transport charity Sustrans, said it was “fantastic news for those living in the successful cities.” He added that getting about by bike for everyday journeys could become a reality for people of all ages and abilities in those areas. “We now urge MPs of all parties to speak up for cycling in Parliament in September, calling for the funding needed to transform Britain’s streets into a continental-style Cycletopia,” he said. Interestingly, in the associated briefing document which outlines the rationale for the Government’s ambition for cycling, the references to cycling being good for our health seems almost throwaway, with the main messaging being around transport and business benefits of investing in cycling. The evidence would seem to indicate that the arguments around health are just as, if not more, powerful and that further more substantial investment could pay dividends for us all.